Unwilling to pop 40-50 Euro for a taxi into Athens? Consider taking the Athens Airport Bus. Most of these buses usually run 24 hours a day, though service on some lines can be almost nonexistent between midnight and dawn. They pick up passengers directly in front of the arrivals terminal by Door 3 and 4. Even when open, the Metro station at the airport is less convenient and requires more dragging of your luggage than the airport buses, and it's twice as expensive. Your ticket will also include a transfer to any other public transportation in Athens if used within 90 minutes. This bus runs to and from the airport, ending at Syntagma Square in central Athens. Many hotels are near Syntagma Square, and it is usually easy to catch a taxi. 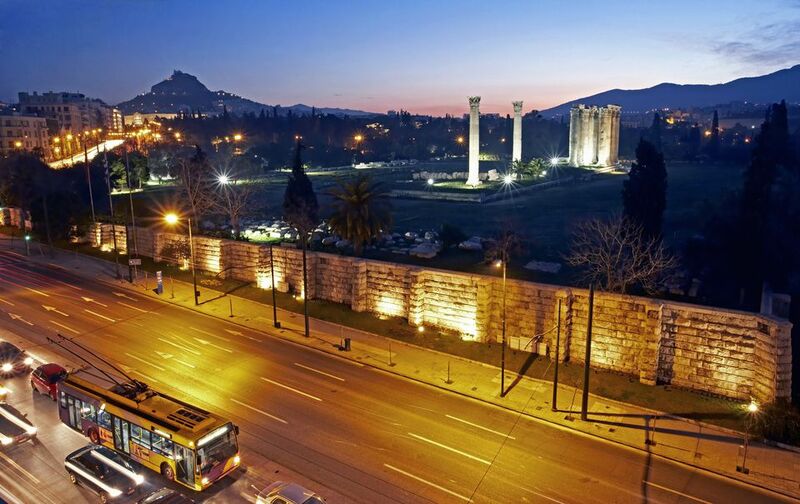 Some hotels, such as the Athens Intercontinental, also offer courtesy shuttles to Syntagma Square, so you may be able to connect with them there directly. The trip into Athens lasts a little over an hour. This bus runs no less than three times an hour. The X96 runs to Piraeus, a handy way to connect with many ferries to the Greek islands. The trip takes about an hour and a half. It runs at least every half-hour. While most arriving tourists will use find either the X95 or the X96 most useful, there are several additional routes which may suit some travelers' needs. To and from Kifissia (see X93 below for a similar name but different location) in the northern suburbs of Athens to the airport. Runs every 45-60 minutes from 5 am to 11:45 pm; every 90 to 120 minutes during the wee hours. Watch the similar name on this one - they sound alike and are easy to mispronounce so the ticket taker thinks you want the wrong one. The X93 runs from Kifisos Station in Athens itself where the intercity buses connect. It runs to and from the Athens Airport, usually on a 40-minute schedule except between midnight and 4:15 am when it runs about every 60-70 minutes. From Dafni Metro Station to and from the Airport. Every 40-60 minutes from about 6 am to 10 pm, then up to 90 minutes between buses. Any recent changes are posted at the official Airport Bus Lines page as well as a diagram of where the buses are at the airport. Look for the new departure screens showing the bus schedules in the arrivals area at the airport. These show when the next bus is due to depart. Tickets for the Athens Airport bus are sold in a small sidewalk kiosk near Door 3 at the Athens International Airport. This kiosk may be unmanned until shortly before the bus arrives. If all else fails, the bus driver can take your money, but they avoid doing this if possible and will send you off the bus with all of your luggage to go get a ticket at the suddenly reopened kiosk. The kiosk itself will strongly prefer the appropriate number of Euro coins rather than large bills. The luggage areas on the buses can fill up fast, so you may end up without a seat and straddling your luggage for the 70-minute trip into the heart of Athens or the 90-minute trip into Piraeus. If you don't know where you're going, and you want the bus to stop at a place near your hotel, let the bus driver know that you need to stop in a particular area and give the name of your hotel. Your hotel or booking service can give you instructions on what area you are in and what to say to a bus or taxi driver; have this with you and follow these instructions closely. Sit close to the driver. Is there a Greek nearby on the bus? Ask them for help and tell them where you want to get off as well. If the driver forgets, this can be a lifesaver. Buses not for you? Consider directly booking pre-arranged airport transfers. For small groups, this is basically a private taxi and for two or more, if it is priced per person rather than per car, it can more expensive than just getting a taxi at the airport. But it can be worth it if you want to be met and not have to worry about negotiating prices. They may also operate during strikes when regular taxis will not be available.